Good morning friends! 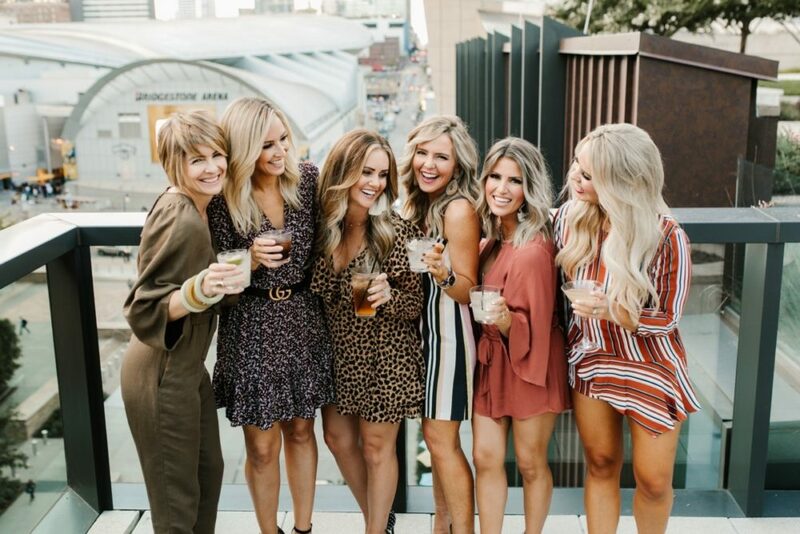 I am so excited to share my girls weekend in Nashville with you today. 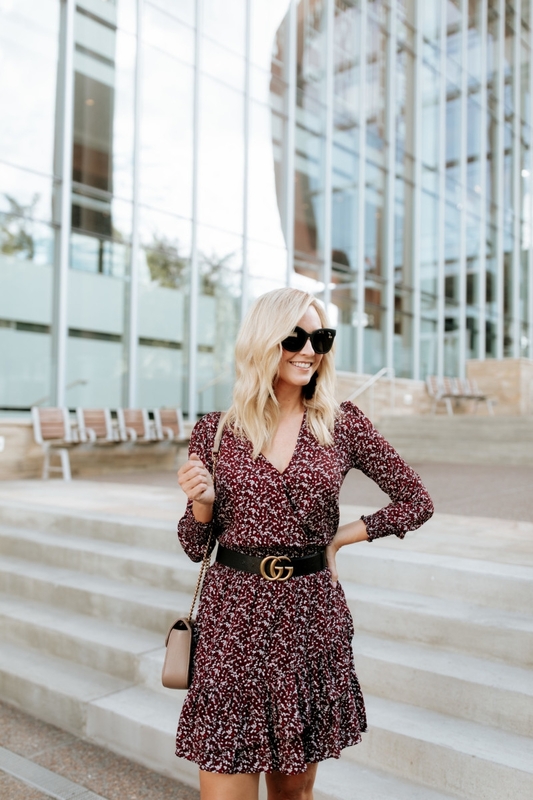 My friend Brooke of KB Styled and Nashville native was more than generous to arrange our entire stay in Nashville and show us non locals the ropes. I had never been to Nashville so I was beyond pumped to spend a few days exploring all this amazing city had to offer. Honestly, Nashville is chock full of so much goodness one weekend just isn’t enough! If you have never been I HIGHLY recommend a couples weekend or girls weekend in Nashville. 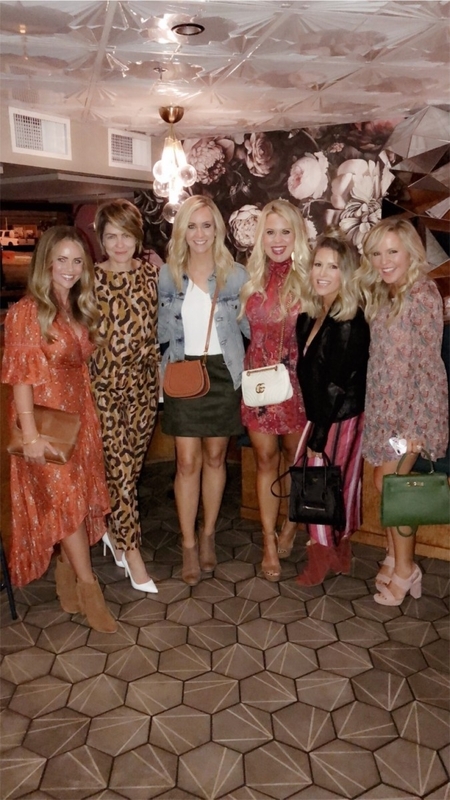 This post is a play by play of our girls weekend in Nashville along with some other amazing venues and restaurants we didn’t have time for. I guess that means I need to go back for more delicious food, fun and shopping! After arrival we went straight to Pinewood Social for brunch. The brussel sprouts were amazing as well as the sandwiches. Every restaurant in Nashville has the most amazing unique decor and special ambiance. Next we arrived at at the Omni Nashville which had the most amazing views. The Omni offers a shuttle service within a few miles which can save you a lot of money. 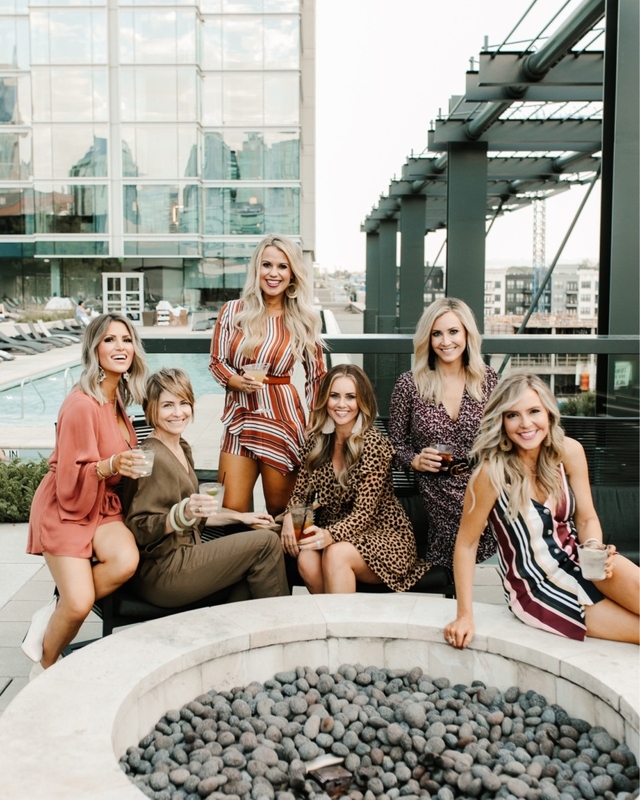 The Omni is situated perfectly downtown so you are right by Broadway (live music, bars, people watching), The Gulch and SoBro. After walking around and exploring the city a bit we came back for a rooftop cocktail and headed to the hotel for dinner at Kitchen Notes. The food was southern fare and superb! I had the meatloaf and it was one of the best I’d ever had (don’t tell my mom)! That night we all walked two blocks to Broadway for some live music and people watching. Each bar had a band playing and there were a lot of birthday party groups, bachelorette parties and girls having a fun weekend away. Workout: This part was a little rough after a night out but we rallied and went to Title Boxing. I had never been to a boxing style workout and it was so much fun! They wrap your hands and give you a pair of gloves while you punch away for 45 minutes. The last 15 minutes of the class was all abs. We felt amazing afterwards and were ready to tackle day 2. For lunch we headed over to The Gulch. This is an upscale area of downtown know for its chic hotels, high end fashion boutiques and trendy restaurants. We ate at St. Anejo, which is a Mexican inspired restaurant. Now I live in Texas so it is hard to top some of our best Mexican restaurants but OMG..some of the best Mexican dishes I’ve had! You have to try the Mexican Street Corn, Quesadillas, Ceviche and Queso! From lunch we headed over towards the Sylvan Park area. We stopped at White Bison Coffee for an iced chai latte. Again, the best chai latte I’ve ever had. We popped in next door to a store called ABLE or sometimes called LiveFashionABLE. Ya’ll this place is something special. ABLE is a one stop shop for ethical fashion. Your purchase may be produced in Ethiopia, Mexico, Peru or at the Nashville headquarters. Each item is made by a woman who has faced extreme poverty or hardship. ABLE makes the softest most perfect denim jacket. I have never felt one so soft! They also make these amazing suede booties. I can rarely put on a pair of booties and not get blisters. I wore these walking around Nashville and then walking around South Dakota the next week. I highly recommend them both! Dinner- We headed back towards The Gulch and had dinner at The Mockingbird. They are known for their seasonal punch in a bag. The punch is made and you get to pick which type of liquor is put in. They add a straw and use a twisty to close the bag. It was delicious and original. The owners and chef were complete characters and had the best stories in town. It’s a little dark and a little blurry but that’s proof of a great night! Nashville has SO many amazing restaurants and music venues. I don’t think I could ever get to them all. I would love to go back to the Grand Ole Opry and see the Country Music Hall of Fame. 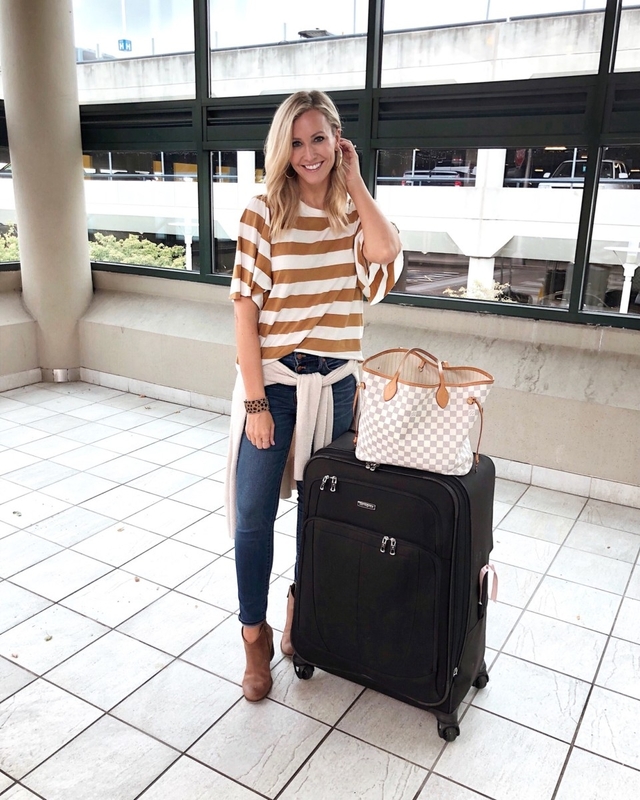 If you have any questions about my trip or must haves from your trip to Nashville, leave them in the comments section! Don’t forget to check out 5 Ways To Style a Camo Jacket and 12 Easy Weeknight Dinners.